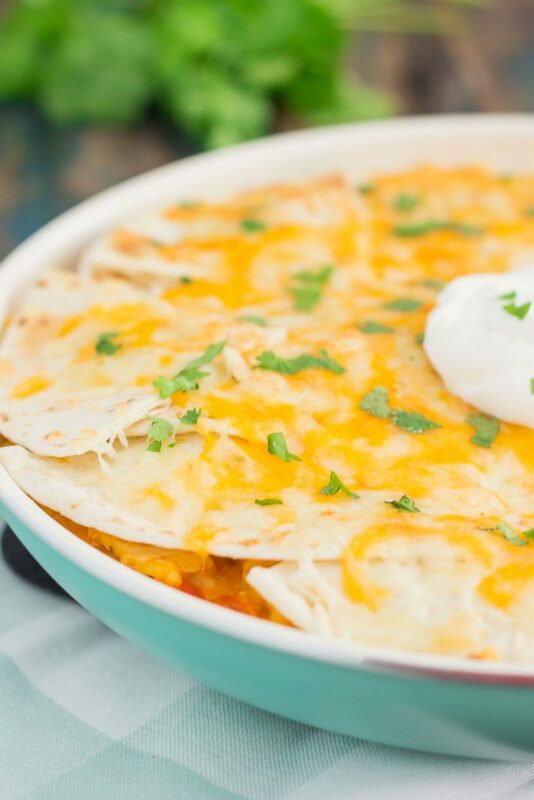 This One Pan Chicken Enchilada Bake is loaded with shredded chicken, hearty rice, and topped with cheesy tortillas. It contains the classic flavor of enchiladas, but in casserole form. Made in one pan and ready in just 30 minutes, you’ll have this simple dish ready to be devoured in no time! Tool time! Or, if you weren’t a child of the 90’s, then it’s also Thirty Minute Thursday. Just incase you really don’t know where “tool time” got its start, it was Tim Allen’s hit line/show on “Home Improvement.” And that takes me back to my childhood days and pictures of JTT (Jonathan Taylor Thomas) hanging on my bedroom walls. Along with Mark Paul Gosselar, Mario Lopez, and Leonardo DiCaprio, of course. But, I’ll save the teen beat talk for another day. And speaking of teen beat, does anyone remember Tiger Beat magazine? Ok, I’m totally aging myself here, but I’m having way too much fun. And I know this is such a cheesy way to start out your Thursday, but whenever the hubster asks me what time it is, I immediately blurt out “Tool time!” or “Time to get a watch” or some other sarcastic, inside joke that we like to give each other. Which is how the opening line of this post happened. Anyways, if you’re still following along after my teenage reminiscing (thank you! ), then let’s get to the main point of today. 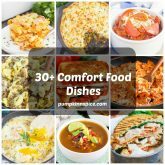 It’s the first Thursday of the month, which means that it’s time to bring you some delicious 30 minute meals! And I’ve got the perfect, one pan meal for this sunny August day. It may not be taco Tuesday, but it’s definitely enchilada Thursday! Since the hubster and I are huge fans of Mexican food, I always like to challenge myself to come up with new dishes. I actually came across this recipe from the spring issue of the Food Network magazine, and I adapted a little to fit my tastes. Bottom line, this One Pan Chicken Enchilada Bake is packed with flavor, full of simple ingredients, and made in just one pan. And did I mention that it’s ready in just 30 minutes? Zesty, delicious, and bursting with Mexican flair, you’ll be going back for seconds (and thirds) of this dish. I used shredded, rotisserie chicken that I found in the deli section of my local grocery store. Of course, you can cook and shred your own chicken (or use ground beef or turkey), but the already-made chicken just makes this meal that much easier. Simply sauté some garlic and chopped onion in a skillet, add in some diced tomatoes, uncooked rice, and water. Let the mixture cook until the rice is tender, and then stir in the chicken, shredded cheese, and cilantro. And for the finishing touch? Quartered soft tortillas, topped with cheese and then broiled until melted. Easy peasy, right? In just 30 minutes, this One Pan Chicken Enchilada Bake is oozing with flavor and ready to be devoured. It makes the most delicious weeknight meal and is great for leftovers, too! 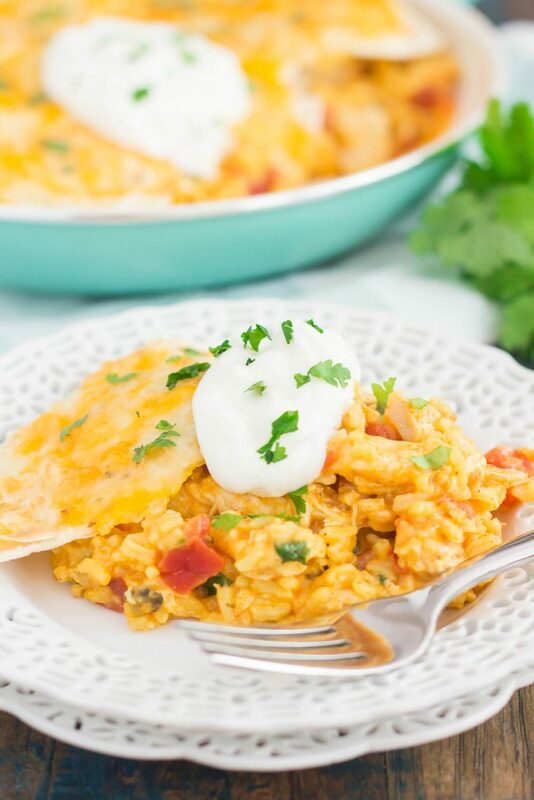 This One Pan Chicken Enchilada Bake is loaded with shredded chicken, hearty rice, and topped with cheesy tortillas. It contains the classic flavor of enchiladas, but in casserole form. Made in one pan and ready in just 30 minutes, you'll have this simple dish ready to be devoured in no time! Add onion and sauté for 2-3 minutes, or until slightly softened. Add in minced garlic and stir to combine. Add taco seasoning, tomatoes, rice, and water. Stir to combine, then bring to a boil. Reduce heat to low, cover, and simmer for 15-18 minutes, or until rice is tender. While rice mixture is cooking, preheat oven to medium broil. Remove mixture from heat and stir in chicken, 1 cup of shredded cheese, and cilantro. Top mixture with quartered tortillas, and sprinkle remaining cup of shredded cheese on top. Broil for 3-4 minutes, or until cheese melts. Remove from oven and top with sour cream and more cilantro, if desired. I like that show a lot. That kid was such a cutie. I wonder what happened to him. Is he still acting? But it's always Tool Time! This looks great. So wonderful for a quick dinner! Haha yes, always Tool Time! Thanks, Mir! Gayle, I love this chicken enchilada bake!!! oh my gawd, all of that cheese! :) and love that you used shredded, rotisserie chicken!!! so great and wonderful time saver! Thank you, Dawn! And yes! Teen magazine was my very first magazine that I ever got...I felt so grown up! I wonder if they even make it anymore?! Oh my gosh, I need all this cheesy goodness in my life NOW!! I'm a ginormous fan of enchiladas in all forms, so I'm swooning over this gorgeous bake, Gayle!! Ok, so I'm digging enchilada Thursday. I think we should make that an official thing. As long as it doesn't bump out Thirsty Thursday. Because I would hate to loose that. Lol. Haha right?! Enchilada Thursday should be every Thursday! Thanks, Liz! Hooray for 30 minute dinners! I love these enchiladas...all that, cheese and just 30 minutes! Yes!!! Thank you, Kathy! 30 minute meals are my favorite! I'm pretty sure I watched every episode of Tool Time as a kid! You made me laugh reminding me about it this morning. 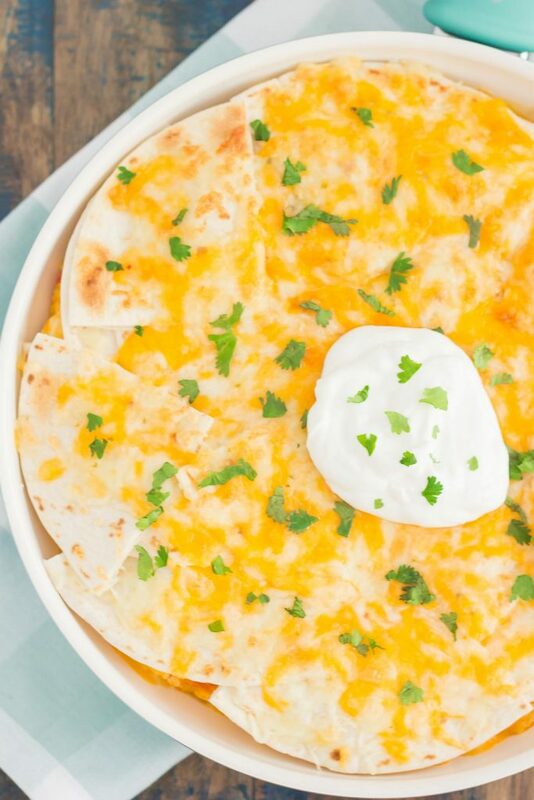 :) This enchilada bake has all of my favorite flavors and it looks SO easy to make! Yum!! Thank you, Kristine! It's one of my favorite meals! We can't have enough recipes like this in our 'quick dinner' repertoire! I just want to dive into that first photo! Pinned!! I don't know if I've ever tried one of these enchilada bakes but I am LOVING this idea! We always have tortillas in the freezer for emergency tacos (right?!? ), but this is a fun new way of using them! It's such an easy meal for Mexican night! Thanks, Ashley! Oh man, I had a big time crush on Leo. But wasn't that almost kind of a law after Titanic came out? ???? This is full of everything I crave: Rotel, rice, and cheesy, cheesy, goodness. I'd definitely have seconds. Yep, it was definitely a law to have a crush on Leo after Titanic, if you didn't already have a crush on him from Romeo and Juliet! :) Thanks, Amanda! You're totally entertaining me with this teen beat stuff, Gayle, and I totally remember Tiger Beat magazine (although I was way out of my teen years when Leo and Titanic came out) haha. I never really watched Home Improvement though but I remember the saying tool time! :) I love anything enchilada, especially when it's made in 30 minutes in one pot! This looks like a meal I would love! 30 minutes, one pan, AND Mexican? They are 3 of my favourite things Gayle! This is some delicious comfort food and it's going on my meal place next week. Yesss, Home Improvement was my favorite! With Saved by the Bell a really, really close second. Zach Morris was my first crush! I could totally go for this meal while watching reruns of any of these great 90s shows!! I loved Zach Morris, too! Thanks for the kind words, Michelle! Haha yes, to Leo, Mark & Mario! And to enchilada Thursday! Love this 30 minute meal, Gayle! Enchiladas my husband's favorite and making them easier in one pan with no rolling sounds like the perfect easy weeknight dinner! Goodness how much I loved that show growing up!!! My sister and I were obsessed! Ahh bringing back so many memories! And this bake! You know I love me some enchiladas! And this is so simple! Thanks for the enchilada love, Ashley! How does just one pan hold all this flavor!? Seriously, this looks AMAZING! I cannot wait to try this one out with the fam! Thank you, Karly! I'm sure your family will love it! OMG, this looks mouthwatering! Love the amount of cheese! Will definitely make it soon! Pinning! Thank you, Mira! I'm in love with the cheese, too! Hey Gayle - hope you're doing well! I know for sure you are creating tasty dishes over here by the looks of this cheesy bake! This would be a giant hit at the dinner table - yum! Thank you for the kind words, Pamela! Haha, I totally loved Home Improvement too - didn't we all! This enchilada bake looks amazing, I love anything Mexican, and one pan plus only 30 minutes just makes it better! Thanks for the enchilada love, Stacey! Gayle, this looks like SUCH an easy and delicious meal! I love Mexican food, especially enchiladas, so I definitely need to try this for dinner soon. Yum! Thanks, Rachel! 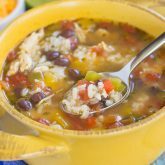 It makes such an easy Mexican meal! Child of the 90's here and totally got that reference haha! 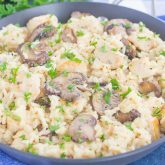 I love how easy these Thursday meals are and how ideal!! This bake looks SO delicious Gayle! Tacos are great on Thursday too! I love that you make this a one pan dish! So much easier to clean up! Thanks, Kate! 30 minute meals are the best! What six pan do I use? Hi Sharon! I used a large skillet for this recipe. I hope you enjoy it! Well, I am well past the Leo crush age, but Ricky Nelson???? Be still, my heart. I love this recipe and plan to add it to my rotation of dishes served. Thanks. Hi, Joyce! Ricky Nelson sounds like a good pick over Leo! :) And I hope you love this dish if you try it. Please let me know how it turns out and thanks for stopping by! Hi Joyce, could I use salsa instead of Rotel? I am dying to make this. Hi Janet! 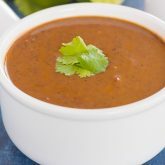 I haven't tried this with salsa, though I think it would be a great substitution for Rotel! Please let me know how this turned out if you try it, and thanks for stopping by!